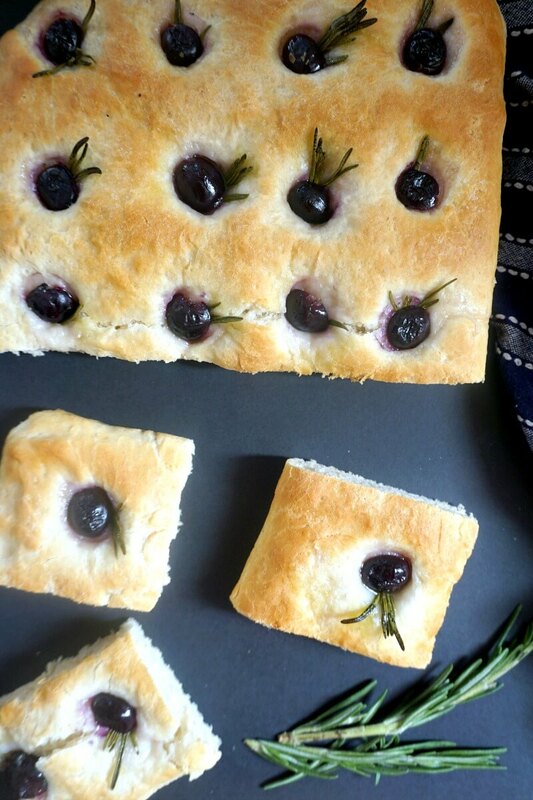 Grape and Rosemary Focaccia Bread, a most delicious homemade Italian bread that can be enjoyed as a side dish or just on its own. It’s a lot easier to make than you think, and a lot tastier than any store-bought version. Making bread is certainly an art. Good old days when we used to consume only freshly-baked homemade bread. I know it’s easier to buy the ready-made one, but, although there’s an abundance of choices out there, the quality is rather poor. And I can’t even say cheap price either. This traditional Italian bread is one of its kind. Baked to perfection, with olive oil being a key ingredient, and the rosemary bringing so much flavour, it’s hard to have only one piece. I was nearly in a carbs coma after eating way too much focaccia today, although I did enjoy every single mouthful. Back to my low-carb resolutions tomorrow, I hope. It’s a flat Italian bread that has the texture of a pizza dough. 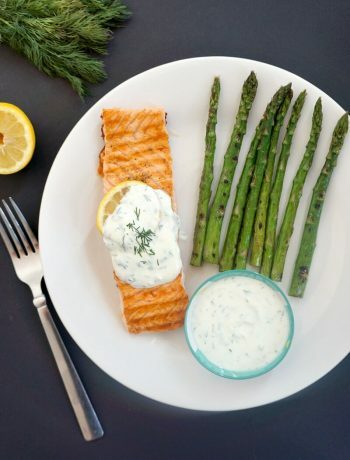 It’s beautifully fragrant, with rosemary being one of the most popular herb choice. Other common toppings, apart from grapes, are thyme, olives, cherry tomatoes, garlic, potatoes, and so on. 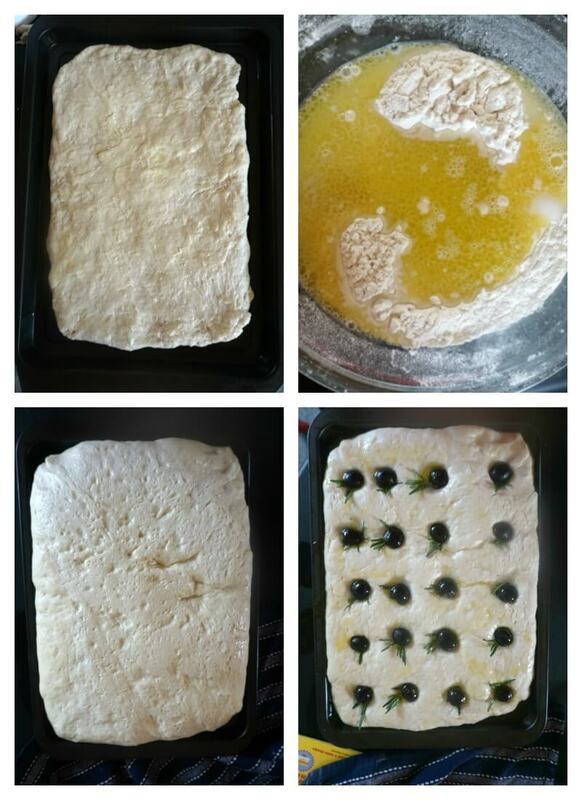 How do you make traditional focaccia bread? 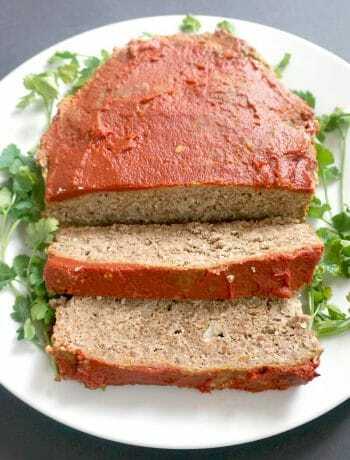 My recipe is well simplified, and only requires one proofing, rather than 2, which tends to be more common. It’s also fairly less kneading, although some effort does go into it. Unless you throw the dough in a kithchen aid and leave the machine do all the work. There is something about kneading the dough by hand though, I find it relaxing, and most therapeutical, so I always choose this way. 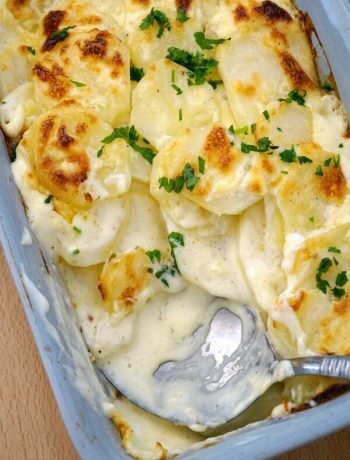 Now, my recipe uses extra olive oil and water as a finishing touch before being baked. It’s not a very common technique, but it works wonders, so I highly recommend this step. First, sift the flour, add the yeast, salt and warm water, and knead well into a dough. Add more flour if necessary, we need a non-stick dough that is nicely stretched. Shape it into a dough, then stretch it over your baking tray, brush with a bit of olive oil, cover with a clean towel, and leave to proof for 2 hours. It will double its size, and fill the tray nicely. Now, at this stage most recipes call for working the dough again to let the air out, and leave to rise again. I totally skipped that part, and left the dough as it was. All you need to do is use a finger to poke the dough in several places, add the rosemary and grapes cut in half, drizzle over the water and olive oil, then bake for about 15 minutes or until golden. Easy! It’s absolutely amazing, baked so beautifully, and it smells like heaven. If you like homemade bread, how about some Easy No-Yeast Yogurt Flatbread? Or some Soda Bread (No Yeast)? 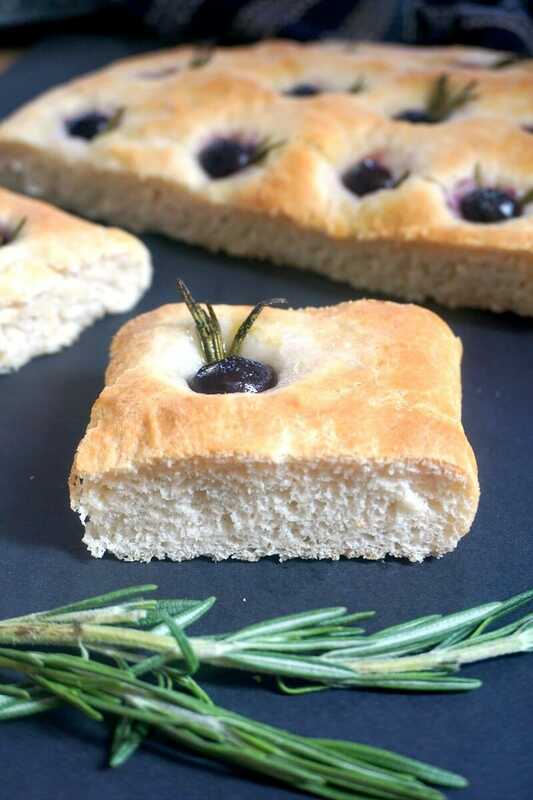 If you’ve liked the RUSTIC GRAPE AND ROSEMARY FOCACCIA BREAD or any other recipe on the blog then don’t forget to rate the recipe and let me know how you got on in the comments below, I love hearing from you! You can also FOLLOW ME on FACEBOOK, and PINTEREST to see more delicious food and what I’m getting up to. 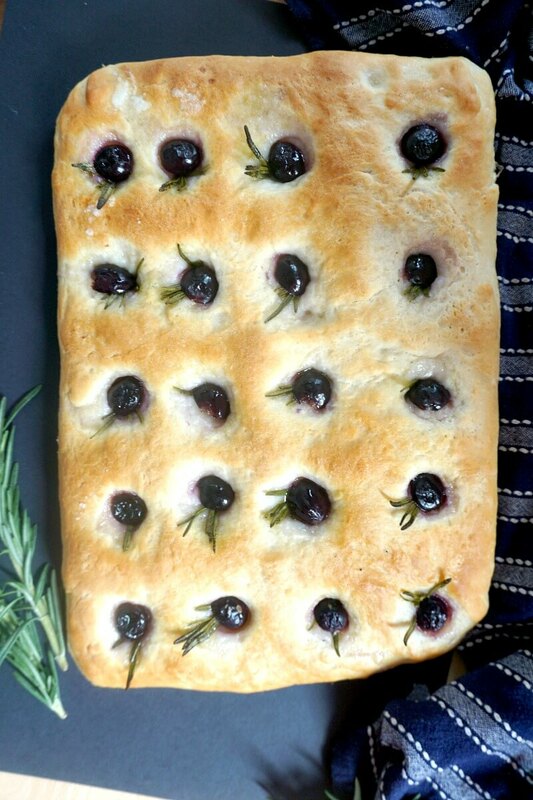 Grape and Rosemary Focaccia Bread, a most delicious homemade Italian bread that can be enjoyed as a side dish or just on its own. It's a lot easier to make than you think, and a lot tastier than any store-bought version. In a large bowl, sift the flour, add the yeast, salt, water and oil, and knead well into a dough for at least 5 minutes. Add more flour if necessary, until the dough no longer sticks to the hands and is stretchy. Brush with olive oil, cover with a clean towel, and leave to proof for 2 hours or until it doubles in size. 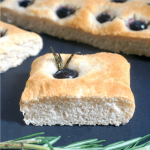 Use a finger to poke the dough in several places, add small rosemary sprigs to each hole and half a grape. Mix the warm water with oil, and drizzle it over the dough. Bake in the preheated oven at 220 degrees Celsius (430 Fahrenheit) for 15 minutes or until golden. So happy you had a proper getaway from the world for a little bit. Your delicious looking bread is a warm welcome back. Thank you, it was a very nice holiday! ? Arata nemaipomenit 🙂 Voi face din nou focaccia, nu ma pot satura cat de buna este painea asta. Multumesc! Este tare buna, ador rozmarinul. ? Thank you, Mila! It is delicious indeed.